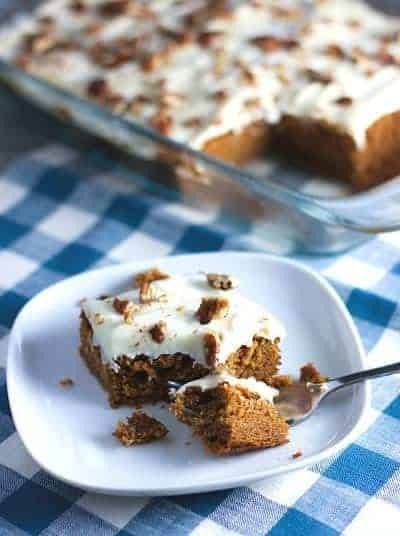 Pumpkin Sheet Cake! This super delicious cake is great for a crowd and is super easy to make. Don’t wait until the holidays to make this fabulous cake! I love that sheet cakes are so popular again. Who has time to bake up a couple layers and decorate? I can almost guarentee that you will never see a fancy schmancy cake on my site. I don’t have the patience or the talent…but sheet cakes? I can do that! The frosting is butter, cream cheese and real maple syrup. But you guys know how we roll. We cheat. You can buy a can of cream cheese frosting , add a couple tablespoons of maple syrup and call it good! We love cake and you can see all of our easy to make recipes HERE! If you need a bit more pumpkin and who doesnt? Try my Pumpkin Crunch Muffins! 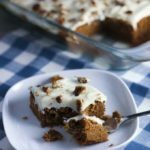 An easy to make delicious cake that will feed a crowd! Mix together cake ingredients, adding melted butter last. Pour into a 9 x 13 inch pan. Bake at 350 until the cake springs back when lightly touched, about 40 minutes. cream together cream cheese and butter. Add remaining ingredients and spread on cooled cake. Sprinkle with chopped pecans if desired. This recipe calls for one cup or 8 oz of pumpkin puree. A small can will do and you will have some leftover. Put it in a baggie and freeze for the next time! Please tell me how much a CUBE of butter is? Thank you. I just made this today. And there are two pieces left! IT WAS SOOOO GOOD! OMG! This is one great recipe. Thank you so much. I also made the Italian chicken as well which was yummy too! I WILL be making this again for just me and probably for thanksgiving as well. My phone is malfunctioning and won’t let me rate it but I give it 5+ stars! Wow! Thank you for the rave reviews! I want to try coconut sheet cake next, they are so easy to make! Have a glorious day! I love sheet cakes. I bet this pumpkin one is so moist and delightful! Love the maple frosting too.